“Changwon, South Korea investors can support Vietnamese businesses with what they are strong at, like supporting industries, equipment manufacturing and high technology. 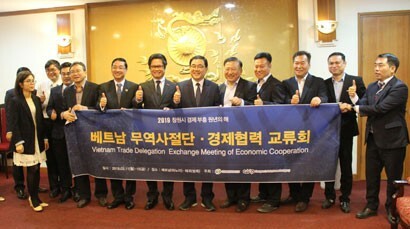 We look forward to the cooperation with South Korean investors in Vietnam in the coming time,” said Mr. Nguyen Hoang, Chairman of N&G Group JSC and Chairman of the Hanoi Supporting Industry Business Association (HANSIBA), at the meeting of VCCI President Vu Tien Loc and Mr. Huh Sungmoo, Mayor of Changwon City, the economic center of South Korea. Vietnam pays special attention to the relationship with South Korea, said VCCI President Loc. South Korean investment has significantly boosted the economic growth, industrialization and modernization of Vietnam. According to the Korea Trade - Investment Promotion Agency (Kotra), South Korean businesses prepare very carefully before they invest in Vietnam. In the coming time, this close relationship with see a booming phase. Currently, seven big Changwon enterprises are present in Vietnam and their projects are very successful, including LG projects, showing cooperation and investment potential of Changwon businesses with Vietnamese partners. Vietnam is in a new stage of development and really needs cooperation, experience and technology transfer from Korean enterprises in general and Changwon City in particular in such fields as supporting and manufacturing industries. They can support Vietnamese businesses improve their competence and skills for experts and technical workers to further grow cooperation. “We expect Changwon companies to lead the new wave of Korean investment in Vietnam in the coming time. The success of Changwon businesses will help other businesses when they invest in Vietnam,” said Dr. Loc. Besides the very developed fields such as import and export and investment, tourism is also a sector of much potential cooperation, he added. Both Vietnam and South Korea have beautiful landscapes, identity and cultural attractions, which will help promote tourism and people-to-people exchanges between the two countries. “VCCI will be positively supporting Changwon businesses to find suitable and reliable partners and projects in Vietnam,” said the VCCI President. Mr. Huh Sungmoo said Changwon City will have three business delegations to Hanoi and Ho Chi Minh City to seek investment opportunities in 2019. Visiting businesses, all very experienced in researching and applying high tech to industrial production, want to study and seek investment and business expansion opportunities in different places in Vietnam. Changwon companies have ample financial potential, advanced technical skills, good management, he said, adding that cooperation with Vietnamese businesses will bring good results in the future. Changwon is one of South Korea’s famous cities with many festivals attracting tourists such as the Kpop Festival, Spring Cherry Blossom Festival and Autumn Flower Festival, he added. This will be a great opportunity for tourism businesses of the two countries to consider cooperation to increase visitors. According to statistics, Vietnam exported US$18.2 billion of goods to South Korea in 2018, up 22.85% over 2017, and imported US$19.01 billion from South Korea, up 1.14%. South Korea is currently a top investor in Vietnam. South Korean investors invested US$349.1 million in Vietnam in January, ranking second among foreign investors in the country with 18.3% of the share.